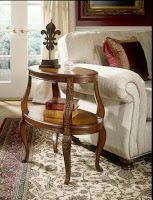 We love this elegant Butler Tuscan Side Table! This decorative table is the perfect accent for your living room sofa or favorite chair. We love furniture that is functional as well as decorative. This table fits that mold as it is a useful accessory as well as a beautiful piece of furniture. The added shelf is great for display pieces or for storage of magazines, books and remotes. The side table has a sleek oval shape that will fit well in most spaces and a unique 2 tier design. It features legs with an intricate hand carved design, and an ash burl and cherry cross-grain border on the tabletop and shelf. The striking piece will provide an interesting focal point in any room. For more details visit www.cheapchicdecor.com.